Summary: The persistent stapedial artery is a rare congenital vascular anomaly that may present as a pulsatile middle ear mass or that may appear as an incidental finding. Five cases of persistent stapedial artery are presented. The CT findings include the absence of the ipsilateral foramen spinosum and a soft-tissue prominence in the region of the tympanic segment of the facial nerve. Three cases were associated with an aberrant internal carotid artery. Imaging identification of this variant may obviate unnecessary surgery and may help in planning surgical or endovascular interventions. The stapedial artery is transiently present in normal fetal development, connecting the branches of the future external carotid artery (ECA) to the internal carotid artery (ICA). Postembryonic persistence of the stapedial artery is rare. The stapedial artery may present as a pulsatile middle ear mass or may be found incidentally during middle ear surgery. The presence of a persistent stapedial artery (PSA) may be recognized with plain radiography, CT, or angiography. Diagnostic imaging studies in five patients with PSA are reviewed. The CT findings include the absence of the ipsilateral foramen spinosum and a soft-tissue prominence in the region of the proximal tympanic segment of the facial nerve. An aberrant ICA is often associated with a PSA. External carotid angiography reveals an absence of the normal origin of the middle meningeal artery. Internal carotid angiography shows a PSA arising from the petrous ICA or from an aberrant ICA running anteriorly and superiorly through the middle ear to supply the middle meningeal artery. This rare congenital vascular anomaly can be diagnosed with CT or angiography, and a surgeon can be alerted to the cause of the clinically evident middle ear mass. Familiarity with the typical appearance of a PSA on the different types of imaging studies may preclude the need for additional studies when a PSA is detected as an incidental finding. Findings in five patients with PSA are summarized in the Table. All patients were examined with CT, and two also underwent catheter angiography. One patient who did not undergo angiography was explored surgically. A 52-year-old woman had a 1-year history of buzzing in the right ear. Physical examination revealed a pink mass visible through the tympanic membrane. A CT study showed absence of the right foramen spinosum (Fig 1). The left foramen spinosum was normal. The right ICA had an aberrant course running laterally in the middle ear cavity without an osseous canal. A soft-tissue density was seen connecting the ICA to the tympanic segment of the facial nerve. The soft-tissue density in the normal location of the tympanic segment of the facial nerve was markedly enlarged. A diagnosis of aberrant ICA with a PSA was made and no further diagnostic studies were performed. Case 1: 52-year-old woman with buzzing in right ear. A, Axial CT scan of skull base shows a normal left foramen spinosum (straight arrow). The right foramen spinosum is absent. The right ICA is laterally displaced into the middle ear (curved arrow). The left ICA is in a normal position. B, Coronal CT scan through right middle ear shows the ICA in the middle ear cavity (straight arrow). The soft tissue at the tympanic segment of the facial nerve is prominent because of the presence of a stapedial artery (curved arrow). C, Coronal CT scan through left middle ear shows the ICA in a normal position below the cochlea (straight arrow). The tympanic facial nerve is normal in size (curved arrow). D, Coronal CT scan at level of vestibule shows the entrance of the aberrant ICA into the right middle ear (arrow). A 14-year-old boy had a 2-year history of headache, vomiting, dizziness, and ringing in the ears. Physical examination revealed a pulsatile reddish mass behind the left tympanic membrane. A glomus tympanicum was suspected clinically. A CT study showed absence of the left foramen spinosum (Fig 2). The right foramen spinosum was normal. The left ICA had an aberrant course through the middle ear. 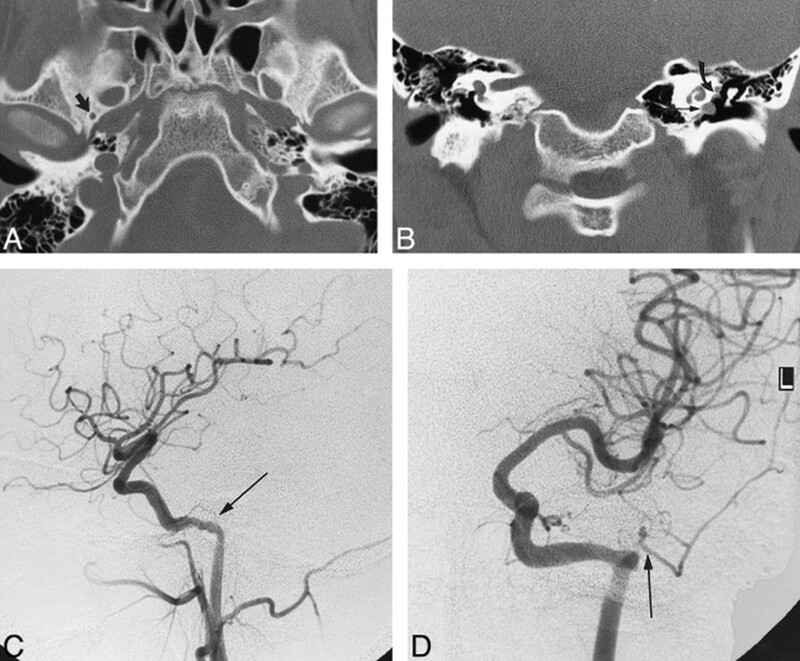 Left common and internal carotid angiography showed the aberrant course of the ICA in the middle ear, the absence of a normal middle meningeal artery arising from the ECA, and the stapedial artery arising from the aberrant ICA. Case 2: 14-year-old boy with headache, vomiting, dizziness, and ringing in the ear. A, Axial CT scan shows a normal right foramen spinosum (arrow) and absence of the left foramen spinosum. B, Coronal CT scan shows the aberrant ICA on the left (straight arrow) and the soft-tissue density of a PSA (curved arrow). C, Left carotid arteriogram, lateral view, shows a PSA arising from the aberrant ICA (arrow). D, Left carotid arteriogram, frontal view, shows a PSA arising from the aberrant ICA (arrow). A 6-year-old girl with a hemangioma of the face presented with vertigo. 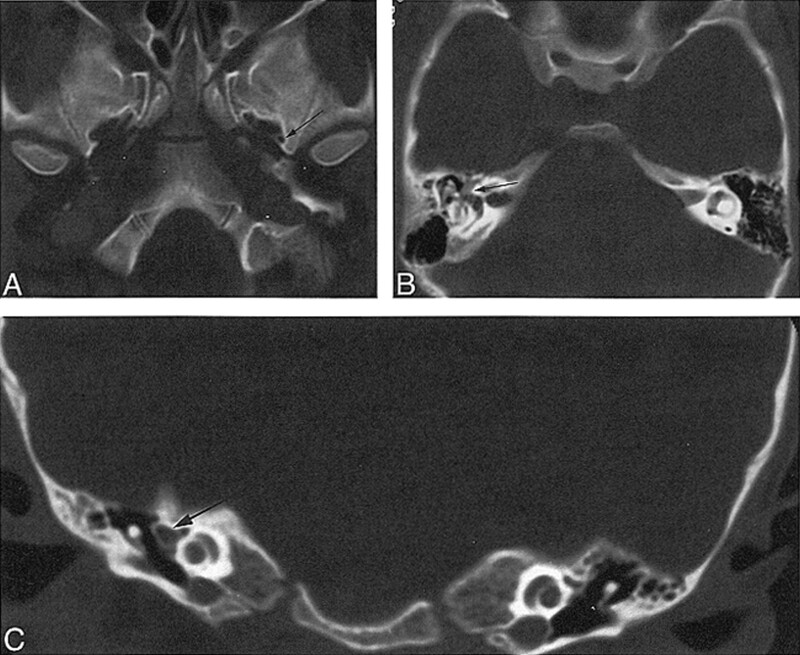 A CT study showed absence of the right foramen spinosum (Fig 3). The carotid canals were normal in position. A soft-tissue density was seen along the course of the tympanic segment of the facial nerve. A diagnosis of PSA was made and no further diagnostic studies were performed. Case 3: 6-year-old girl with vertigo. A, Axial CT scan shows a normal left foramen spinosum (arrow) and absence of the right foramen spinosum. B, Axial CT scan through middle ear shows prominent soft tissue, representing facial nerve and PSA (arrow). C, Coronal CT scan through middle ear shows prominent soft tissue, representing facial nerve and PSA (arrow). A 25-year-old woman had a 1-year history of dizziness, right-sided hearing loss, and bilateral pulsatile tinnitus with the right side more severe than the left. Physical examination revealed a pulsatile mass over the right promontory. A CT study showed absence of the right foramen spinosum and prominence of the tympanic segment of the right facial nerve (Fig 4). The carotid canals were normal in position. A preoperative diagnosis of glomus tympanicum versus PSA was made. Catecholamine levels were normal. Surgical exploration revealed an artery coursing through the stapes, which is typical of PSA. The PSA was lysed and cauterized, with no neurologic complications, and the tinnitus completely resolved. Right-sided hearing loss has progressed, however, and the patient is being followed up for mild otosclerosis. Case 4: 25-year-old woman with pulsatile tinnitus. B, Coronal CT scan through right middle ear shows the soft tissue at the tympanic segment of the facial nerve is prominent because of the presence of a stapedial artery (arrow). C, Coronal CT scan through left middle ear shows the tympanic facial nerve is normal in size (arrow). A 5-year-old boy had a 3-year history of headache and recent onset of transitory neurologic deficits, including alternating paralysis. A CT study revealed absence of the left foramen spinosum. 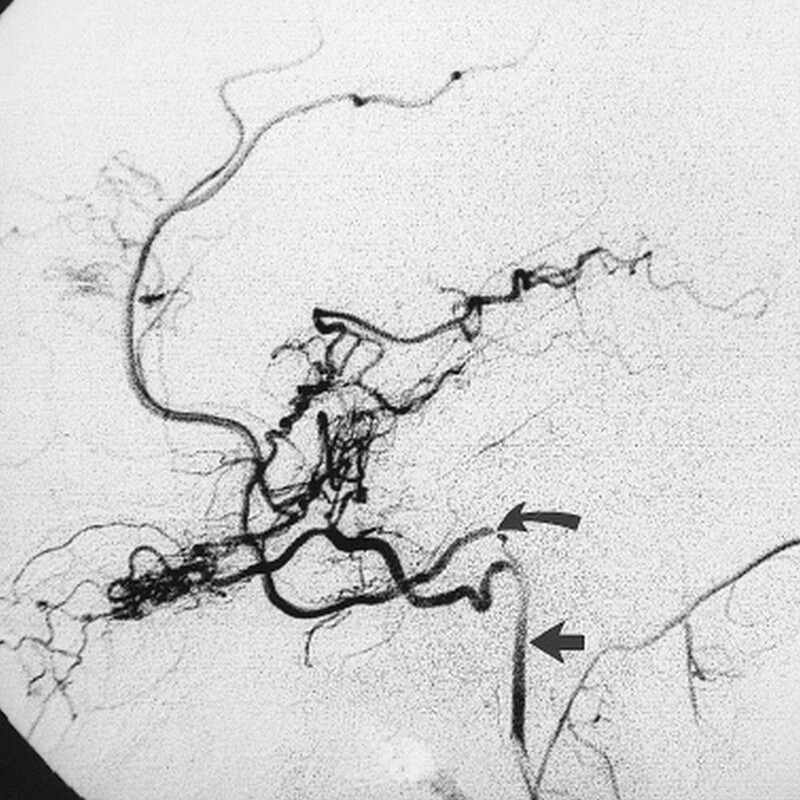 Left internal carotid angiography showed an aberrant course of the ICA (Fig 5). The ICA was small in caliber. Intracranial vascular occlusive disease with a collateral pattern typical of moyamoya disease was demonstrated. The PSA arose from the ICA in the middle ear. The middle meningeal artery arising from the PSA contributed collateral supply to the cerebral circulation. Encephalosynangiomyomatosis was performed to supplement the physiologic collateral supply. The embryologic development of the cranial vasculature is complex. Early work in this area was performed by Congdon (1). Padget built on Congdon's work and described the early embryologic development of the stapedial artery in tremendous detail (2). The following simplification of the embryology of the stapedial artery and its relation to the normal adult circulation is based largely on the work of these two investigators. The embryologic development of the branchial system produces six paired aortic arches and corresponding arteries. These arches connect the dilated portion of the ventrally located truncus arteriosus, the aortic sac, to the dorsal aortas. The six arches develop in numerical order and are not all present at the same time. The first arch gives rise to the mandibular artery, which later regresses. The second arch becomes the hyoid artery. The hyoid is prominent in early development and normally persists as the caroticotympanic branch of the ICA (2). The mandibular and hyoid arteries become branches of the third arch when the first and second arches involute. The stapedial artery arises from the hyoid artery near its origin from the proximal ICA (third arch) at 4 to 5 weeks of fetal life (crown rump length of 4–8 mm). The stapedial artery extends cranially from the hyoid artery and passes through the mesenchymal primordium of the stapes, forming the obturator foramen of the stapes at the 7- to 10-mm stage (3). The third arch forms the common carotid artery as well as the proximal ICA. The embryology of the lower aortic arches is not relevant to the development of the stapedial artery and is beyond the scope of this discussion. The stapedial artery divides in two after entering the cranial cavity. The upper (supraorbital) division becomes the middle meningeal artery and also supplies the orbit (4, 5). The supraorbital division transiently anastomoses with the ophthalmic artery. The orbital branches of the upper division are normally annexed by the ophthalmic artery (6). The lower (maxillomandibular or maxillofacial) division has a mandibular branch (a different vessel than the mandibular artery arising from the first arch) and an infraorbital branch, which develop into the inferior alveolar and infraorbital arteries, respectively. This division leaves the cranial cavity via the foramen spinosum. Anastomoses develop between the lower division branches and the ventral pharyngeal arteries arising from the aortic sac (1, 3). The ventral pharyngeal arteries are the roots of the definitive adult ECAs (3). Flow reverses at the foramen spinosum, and the stapedial artery usually degenerates during the 10th week (5). The normal course of development of the stapedial artery and its connections are represented schematically in Figure 6. The vessels previously supplied by the stapedial artery are then supplied by the ventral pharyngeal arteries, which become the ECA, and by the ophthalmic artery. The hyoid artery decreases in size and persists into adulthood as the caroticotympanic branch of the ICA (3). 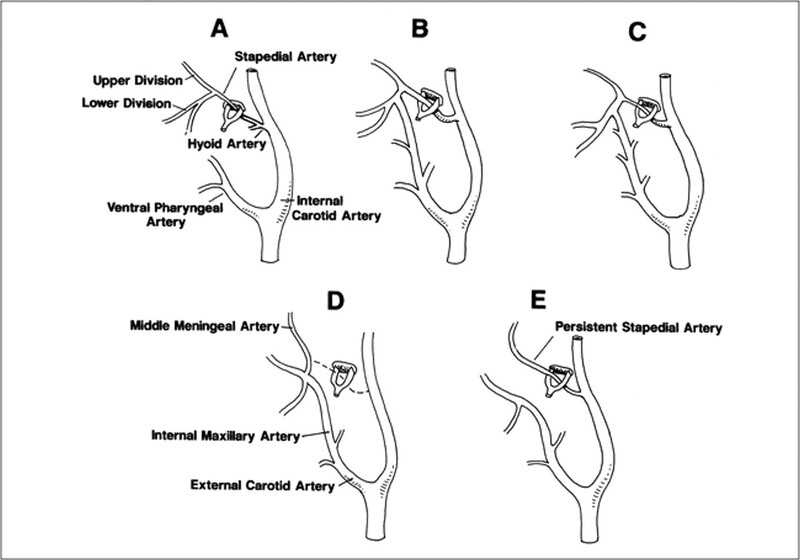 Schematic representation of the developmental stages of the stapedial artery. A, The hyoid artery arises from the ICA. The stapedial artery arises from the hyoid artery near its origin. The stapedial artery branches into upper and lower divisions after passing through the stapes. The ventral pharyngeal arteries are the precursors of the definitive ECA. The stapedial artery is the only supply to the upper and lower divisions. B, Anastomosis forms between the ventral pharyngeal artery and the lower division branches. C, The stapedial artery decreases in size. D, Normal adult anatomy with involution of the stapedial artery. E, Anatomic configuration of typical PSA. In this complex development, the stapedial artery gives rise to the anlage of the inferior alveolar, infraorbital, middle meningeal, anterior ethmoidal, frontal, supraorbital, and lacrimal arteries (3). After involution of the stapedial artery during the third fetal month, these arteries normally are supplied by the maxillary artery and the ophthalmic artery (3). The embryologic connection of the supraorbital branch to the ophthalmic artery provides a basis for the occasionally seen origin of the middle meningeal artery from the ophthalmic artery and the origin of the ophthalmic artery from the middle meningeal artery. When the stapedial artery persists into postnatal life, the middle meningeal artery typically arises from it. The foramen spinosum, which normally contains the middle meningeal artery, is absent. The vascular supply to the mandibular and maxillary regions is from the ECA. The PSA has a typical course. It arises from the petrous ICA, enters the anteromedial hypotympanum, and is contained in an osseous canal. The PSA crosses and is contained in Jacobsen's canal for a short segment (6). It leaves its osseous canal at the promontory and then courses dorsally and cephalad through the obturator foramen of the stapes and enters the facial canal through a dehiscence just behind the cochleariform process (3, 4, 6). The PSA travels anteriorly in the anterior facial canal and exits the canal just before the geniculate ganglion. It then travels anteriorly and cephalad in the extradural space of the middle cranial fossa (4). Fifty-six cases of PSA have been reported after the initial description by Hyrtl in 1836 (7–11). Most cases were discovered at postmortem examination, and there are a few scattered surgical reports. Imaging findings have been reported in several cases. Angiographic findings have been reported in seven cases (3, 9, 10, 12–15), and CT findings have been reported in four cases (9, 11, 13, 16). Moreano et al (17) reported a prevalence of 0.48% in a series of 1048 temporal bone dissections. Most authors, however, report a lower prevalence of 1:4000 to 1:10,000 (3, 8, 18–21). Aberrant ICAs are frequently associated with a PSA. Steffen (3) suggested that traction from a PSA may result in the aberrant position of the ICA. It is now more commonly accepted that the aberrant ICA is a collateral pathway resulting from a segmental agenesis of the ICA (22, 23). According to this theory, the inferior tympanic branch of the ascending pharyngeal artery assumes the role of the ICA and enters the tympanic cavity through Jacobson's canal. It anastomoses with the caroticotympanic artery (the remnant of the hyoid artery) and connects to the ICA proper distal to the segmental agenesis (24). Three of our five cases of PSA were associated with an aberrant ICA, which is much greater than the frequency generally reported. The high rate of occurrence in our series may stem from the fact that the presence of the aberrant ICA led to a dedicated temporal bone CT scan, which was then carefully evaluated for vascular anomalies. The PSA typically has a diameter of approximately 1.5 to 2.0 mm, although a vessel as small as 0.4 mm has been reported (4, 6, 15, 25). The identification of a PSA on imaging studies may improve patient care in many ways. Facial nerve tumor involvement of the anterior aspect of the tympanic segment can be excluded. Knowledge of the pathogenesis of a pulsatile mass in the middle ear may either prevent unnecessary surgery or help in surgical planning. Exclusion of a vascular tumor as the cause and identification of a PSA may be all that is necessary. If a PSA is the presumed cause of tinnitus, surgical ligation or endovascular occlusion may be considered. Some authors have considered the presence of a PSA to be a possible contraindication to stapedectomy (5); others have urged caution in this setting. Govaerts et al (8) reported damage to a PSA without apparent complication. In one of our cases, ligation was performed without complication; however, the presence of a PSA may complicate any tympanotomy, particularly if it is not expected. PSA has reportedly complicated stapedectomy (16) and cholesteatoma resection (8) and prevented cochlear implantation (11). Preoperative knowledge of the presence of a PSA may allow the surgeon to plan the operation better and to explain more thoroughly the risks to the patient. Understanding the anatomy and connections of a PSA may also be of use in planning endovascular interventions. The majority of patients with PSA reported in the literature have been asymptomatic. Guinto et al (12) reported one patient with pulsatile tinnitus presumed to be the result of a PSA. Our patients, who had tinnitus, buzzing, ringing, and vertigo, may represent exceptions in which the PSA was symptomatic. In patient 4, the symptoms resolved after ligation of the PSA, making it likely that the PSA was the cause of the symptoms. The aberrant ICA in the two other patients with tinnitus also may have been responsible for their symptoms. PSA is a rare anatomic variant. The true prevalence is unknown, but is approximately 1:5000. The rate of in vivo detection of this variant may increase with a more thorough understanding of its appearance on CT studies. The diagnosis of PSA can be made with the use of high-resolution temporal bone CT or angiography. The diagnosis can be suggested by absence of the foramen spinosum on CT scans or plain radiographs; however, this finding is nonspecific and may also be seen in cases in which the middle meningeal artery takes its origin from the ophthalmic artery. The detectability and appearance of a PSA on MR images or MR angiograms have not been reported. The small size of the typical PSA would most likely make detection by MR imaging or MR angiography difficult. Imaging identification of this variant may obviate unnecessary surgery and may help in planning surgical or endovascular interventions. ↵1 Presented in part at the annual meeting of the American Society of Neuroradiology, Toronto, May 1997. ↵2 Address reprint requests to Richard Silbergleit, MD, Department of Diagnostic Radiology and Medical Imaging, Henry Ford Hospital, 2799 W Grand Blvd, Detroit, MI 48202.